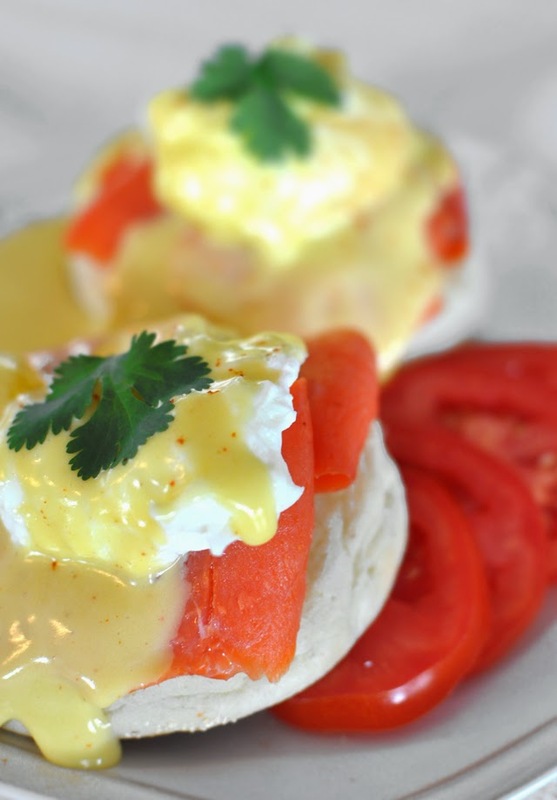 Smoked Salmon eggs benedict, one of my favorite breakfast foods ever. In general I enjoy savory breakfast over stuff like pancakes and waffles, even though I certainly like those as well, but there is nothing better than eggs for breakfast and these are amazing. Eggs for any meal are amazing and we certainly had eggs benedict for dinner many times. If you like smoked salmon try this version of them, I promise you will love it! To poach your eggs heat some water on medium heat but do not bring the water to boil and add the vinegar. Break the eggs into a bowl, stir the water a little bit in the pan before inserting the eggs from the bowl gently into the pot. I like doing the eggs two by two. Most people like to cook the eggs between four and five minutes, but I prefer mine cooked three to four minutes tops. While your eggs are poaching toast the English muffins and then spread the butter over the top. Arrange salmon slices on the muffins and then top each with the poached egg. Season with salt and pepper and then pour some of your Hollandaise sauce over the eggs. Pour 1-inch of water into a large saucepan; over medium heat, bring to a simmer. Once simmering, reduce the heat to low. Remove the bowl from over the pan and gradually add the butter, 1 piece at a time, and whisk until all of the butter is incorporated. Place the bowl back over the simmering water occasionally so that it will be warm enough the melt the butter. Add the salt, lemon juice, and cayenne pepper. Serve immediately or hold in a thermos to keep warm. Wow!Fantastic recipe.It looks so tasty! !Thank you for sharing this tasty recipe with us.All the ingredients used here are easily available in the market.i will definitely try to make this in home.Visit Custom Dissertation Writing Service to get more articles like this.